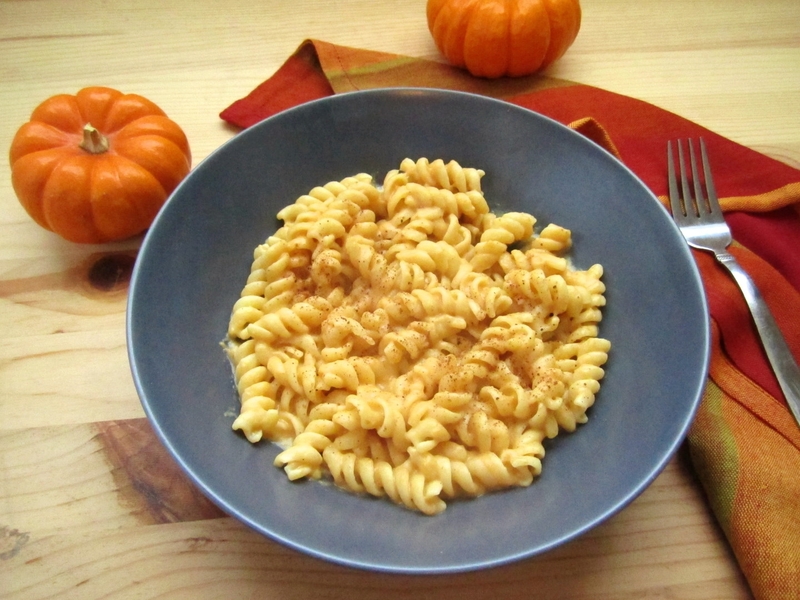 Pumpkin Mac and Cheese (Low-Fat and Low-Carb!) - Eat. Drink. Love. Last week, I posted my recipe for buffalo chicken mac and cheese and I told you all that I also made a different mac and cheese recipe for myself. While my husband is a buffalo fanatic, I can only really stand to eat a few bites and then I’m over it. I know, I’m weird like that. And a few bites was certainly not going to satisfy me for dinner! So, I made myself this pumpkin mac and cheese. In order to cut some calories, I skipped the butter and cream, used skim milk and reduced-fat cheddar cheese. And I also used a low-carb pasta! This mac and cheese was really easy to throw together and it doesn’t require any baking! I really liked this, but next time I make it, I think I might throw in some veggies for added texture and flavor. Some roasted squash and zucchini tossed in would be awesome! 1. Cook pasta until cooked, drain and set aside. In a saucepan, heat the milk and pumpkin puree. Whisk until the pumpkin is dissolved into the milk. Add nutmeg. Add in your cheeses and whisk until the cheese is melted and the sauce is smooth. If your sauce seems a little thick, you can add more milk 1 tbs. at a time. Put the pasta in a bowl and pour the sauce over it. Stir until it is thoroughly mixed in with the pasta and serve! No baking required! Super Bowl Recipe Roundup and a Super Bowl Link Party! The addition of pumpkin flavor in this dish does intrigue! Also the bonuses of being low fat and low carb, makes me want to make this even more. Thanks for this tasty recipe-Steph and have a great day. Pumpkin and gruyere – I can see that./ And adding some roasted vegetables is a good idea. Love the variations on a theme – this is a welcoming nourishing recipe for November! Goodness know, the outside doesn’t beckon here. Might as well have the kitchen welcoming. GREAT idea Stephanie. This looks so wonderful! Simple yet healthy? Yes, please!!! Really yummy! Looks so comforting. There is something about the curly noodles that I cannot resist. Making two different things sounds like a lot like some of the dinners me and my husband have. His and Hers is the way to go. What a great mac & cheese! Great idea adding the pumpkin and cutting back on the cheese. Love the use of the Gruyère! I’m that give it a rich, cheesy flavor. Great recipe! Thanks for stopping by my blog! Yum! What a great recipe. Nothing beats mac and cheese! 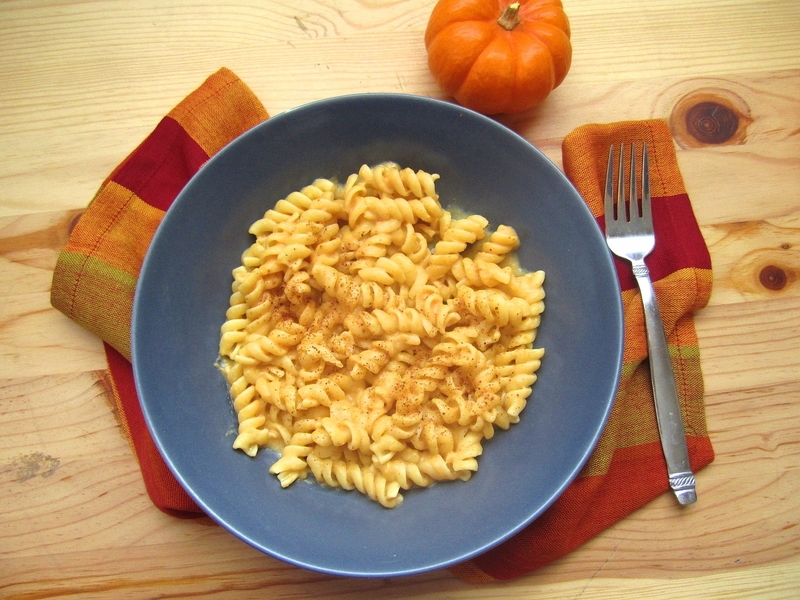 Macaroni and cheese is one of my favorite comfort foods…and I love pumpkin! I don’t know how I’m not all over making this dish yet! A great use for the Dreamfields pasta! What a wonderful, healthy dish. My hubs and son would go nuts for this one. So creative. Canned pumpkin cannot be found here, so unfortunatly I can’t try this one any time soon, but it looks really good. Any lightened version of pasta is always a winner in my book! A delicious healthier version of mac&cheese. I think, just like you said, adding some veggies to it would make it even more yummy! MMM sounds tasty, and it’s so festive! I’ll have to bookmark this for later! I love pumpkin or squash with mac and cheese – and your recipe is awesome because it doesn’t require baking! Oh, this is fantastic! 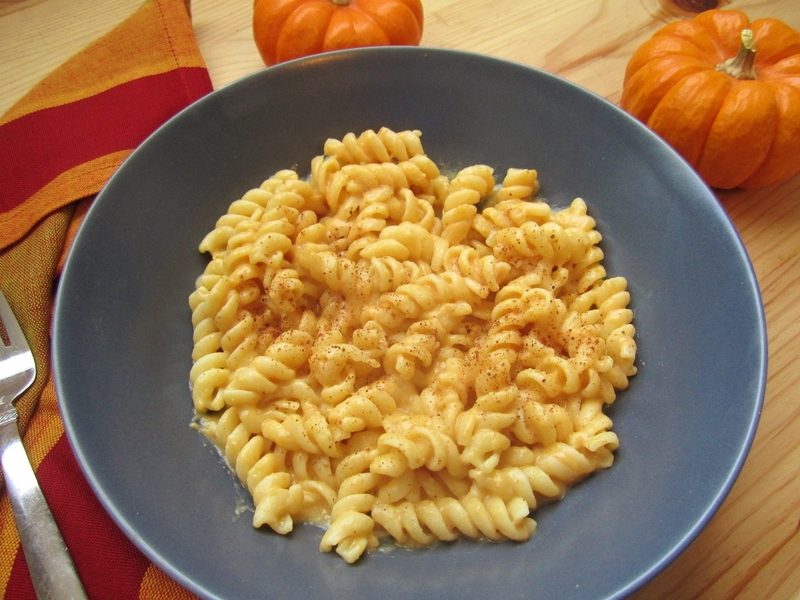 I’ve never tried pumpkin mac & cheese….it’s something I would love to try! Have a great day! I want to… am tempted to… would like to admit I am brave enough to try pumpkin in my pasta but I just haven’t done it yet. This mac and pumpkin cheese looks delicious and creamy though! I’ve never thought to ad pumpkin to mac and cheese, but it looks wonderful! Such a great idea – and healthy too! This is a great idea for mac and cheese. It’s so easy to get locked in to pumpkin on the sweet side of the menu, and a savory alternative is so great to have. And adding gruyére… well, need we say more! What a great new use for pumpkin puree. I’m mostly likely going to have some leftover and I’m definitely going to save it so I can make this. I keep seeing this and I totally want to make it. I love that your version is low fat and low carb. YUM!